Network Releasing are on a roll! Earlier this year they released the wonderfully subtle and nostalgic Martin Scorsese & Alec Baldwin produced Lymelife. This month they are set to release the rather awesome and wacky Dream Home (19 November). A little while ago I was lucky enough to see Dream Home. I had heard some good things about it so I wasn’t going in totally blind. My understanding was that it centered on someone’s attempts to acquire a Dream Home under some tough conditions in the Far East. After reading the synopsis and watching the trailer visions of; Three Extremes (Sam gang y), Audition (Ôdishon), The Ring (Ringu), Dark Water (Honogurai mizu no soko kara), The Grudge (Ju-on), One Missed Call (Chakushin ari), Pulse (Kairo) and other great Eastern shockers seeped into my consciousness. So the screening was certainly going to be interesting if nothing else. Soho Screening room. Lights dim. Projector flares up. For the next 96 minutes the audience veers from white knuckle terror, cringing disgust, to giggles & back again and by the time the credits roll it had completely charmed me. I absolutely loved Dream Home. The gist of it is that Cheng Li-sheung (Josie Ho) is a hard working young lady; she works in a thankless job in a bank call centre dealing with dismissive clients all day. Unlike her colleagues when the day ends she does not head out to blow off some steam, she heads to her second job as a sales assistant in a clothing store. She has a callow boyfriend, who’s married, not to her - who fits her in around his work, wife and golf schedule. She supports her sickly ungrateful father and at every turn her attempts to buy a home are dashed. You soon get the picture that young Cheng’s life seems empty and oppressed, something of a modern day Hong Kong Cinderella, desperately needing the help of a fairy godmother. Dream Home has a similar narrative structure to a Quentin Tarantino film, so the story rolls out in flashback as well as real time - building up to the climax. So we really get to understand more about Cheng’s motivations, her back story and her dream of owning a home - with a harbour view. All the way from her humble childhood through to her butterfly like metamorphosis to the screen's latest slasher queen. I don’t think I’m going out on a limb when I say watching Cheng’s convincing transformation was like witnessing the birth of a new screen character similar to the likes of; Patrick Bateman (American Psycho), Michael Myers (Halloween) and Ghostface (Scream). Dream Home is not any of those great Easternt horrors I listed above, it’s something different and not going to be easy to pigeon hole. Which is why I’m not surprised that it’s being pitched as a slasher film and the dark satire has been played down. Make no mistake it will horrify and there is a fair amount blood and gore. But it's beautifully shot and you’ll be chuckling - sometimes at the gore. 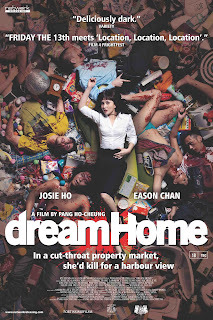 Key to Dream Home is that it has an emotional focus and charm, which comes down largely to Josie Ho’s portrayal of Cheng. I could not help feel sympathetic to her going through the troubles and tribulations as she tries to fulfill her childhood dream and I’m pretty sure she’ll win you over and even though she has a dark side you’ll be silently rooting for her. It’s easy to see why Hollywood have snapped Josie Ho up and she’ll soon be seen in, not one, but two major productions; Steven Soderbrgh's Contagion starring; Gwyneth Paltrow, Matt Damon and Marion Cotillard as well as in acclaimed director Hany Abu-Assad’s The Courier starring along side Mickey Rourke and Dean Morgan. Dream Home is deftly handled by Pang Ho-cheung and although it’s efficient, it’s beautifully shot especially the scenes of Hong Kong architecture. The visuals and editing are slick and innovative (including some class gore FX) throughout but maintain the emotion. I guess the highest compliment regarding the production that I can throw out is that; it’s an Eastern film, with an Eastern cast, shot in Cantonese, gives a really good feel for Hong Kong but translates very easily to a western audience. This may have been helped by the relevant and topical subject matter but Dream Home is one very well made film. For fairness I should mention that there were a couple of minor errors in the subtitles on the print I saw - although, if anything I felt it added to the charm of Dream Home. Dream Home will be on a big screen near you this Friday 19 November. And is our pick for this week's releases. Over at the Dream Home microsite.